For applications requiring high rigidity, increased load capacity, superior accuracy and maintenance-free operation, IKO’s C-Lube Linear Roller Way Super MXL Master Grade is the way to go. This model is part of our C-Lube Linear Roller Way Super MX family, which features a range of load capacities and mounting configurations. The Super MXL Master Grade low fluctuation specification provides superb high-precision feeding. The special raceway processing suppresses small running deflection which reduces fluctuation by about 50% compared to other extra-long units. Low fluctuation is ideal for ultra-precision linear motion on machine tools that require high-precision, high-quality processing; while the extra-long unit improves load capacity and rigidity in mechanical equipment. The C-Lube lubricating element features a unique capillary system consisting of a porous resin part integrated in the recirculating path of the end plate. 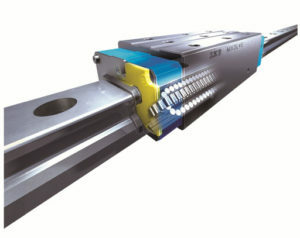 As rollers circulate within the linear guide, lubricant is continuously distributed to the loading area along the track rail. The result is maintenance-free operation guaranteed for five years or 20,000 kilometers, and reduced environmental impact due to the small amount of oil required. C-Lube is incorporated inside the slide unit, keeping size and weight to a minimum. Because C-Lube has no contact with the track, smooth motion is achieved without an increase in rolling resistance. IKO Super MXL Master Grade is the ideal choice for machine tools requiring low fluctuation, high precision linear motion. IKO designs and manufactures a wide range of crossed roller bearings that can handle radial, thrust and moment loads at the same time in compact sectional dimensions. 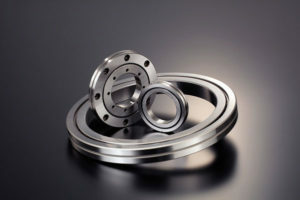 Our crossed roller bearings have rollers alternately crossed at right angles between inseparable inner and outer rings. Because the rollers in these bearings make line contact with the raceway surfaces, there’s minimal elastic deformation under load. Compared to ball type bearings, line contact of crossed roller bearings achieve higher dumping characteristics with zero or minimum preloading (T1) and more durability with anti-fretting feature under vibration of the machine. Most of our crossed roller bearings also have a retainer or separators between cylindrical rollers, allowing for ultra-smooth and high-speed rotation. Mounting hole type high rigidity crossed roller bearings expand the flexibility of the installation method to make the assembling process of the machine easier. IKO Crossed Roller Bearings offer accuracy and rigidity and are the perfect choice for motion systems with relatively high rotational speeds. For more information on these or other IKO products, visit www.ikont.com.